The house at 237 (Later 44) Belle Vue Road Golden Square Bendigo was home to Henry Qualtrough and his wife Elsie. They raised seven children in the house. Eldest son Jack lived on the Porter Street side next door. Youngest son Alan built a house in 1960 on the top side. This house lies on an allotment granted to R (Robert) Lisle in 1865. Robert Lisle was a pioneer of the Bendigo District. His father John married , at Lowick, Northumberland in 1791 Anne Coxon from Cartington. Their family of six children included Robert (1821) who married, at Longhoughton in 1848 Mary Straughan. In 1841 Mary was one of six servants living with Thomas Browne ’of independent means’ and his family in Amble but in 1851 Robert and Mary were in Newcastle upon Tyne where Robert was a Joiner’s journeyman. The discovery of alluvial gold at Ballerat, Victoria in 1851, and a second find shortly afterwards at Bendigo, saw a great rush of Australians to the digging to try to make their fortunes.Robert and Mary sailed to Australia ,possibly amongst the 284 passengers aboard the ‘Washington Irvine’, in December 1852. After a short stay in Ballerat the couple moved to Bendigo in 1856 where Robert joined the ranks of gold diggers. They arrived with very little but by 1858 Robert was one of the six owners of the Union Company Mine, Golden Square. All were members of the Golden Square Methodist Church of which Robert became a founder member after a deeply moving experience. Later he took a share in Bruce’s Crushing Mill selling this in 1861 to finance a trip to the ‘old country’. He, and Mary, returned to Australia in 1862 amongst the 481 passengers aboard the S.S. Great Britain. Robert and Mary celebrated their Golden wedding anniversary in 1898 when 250 were invited ‘to partake of a social cup of tea with two well known residents of Bendigo’ in the Wesleyan school room. The house was built about 1865. He also purchased a Lot adjoining on the north. Directories of the period list Robert Lisle as a miner in Golden Square. Mr. Robert Lisle, mining pioneer, and a liberal supporter of the Golden Square Methodist Church, died, aged 91 years. He came to Victoria from Northumberland in 1854, and was for some years mining on the Sheepshead Reef. Today's nearby Lisle Street presumably commemorates his name. 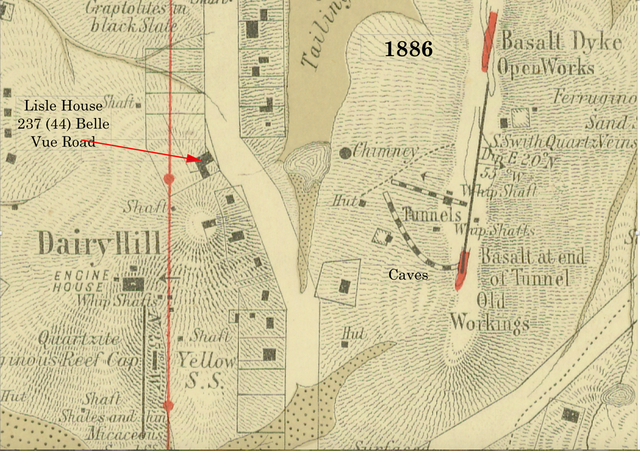 Lisle, listed as a quartz miner, owned a house and land on the Sheepshead Reef early in the 1860s. By 1865 he owns and occupies this property and continued to do so until early this century, when he was described as a ‘mine manager.' Lisle is thought to have partnered Abraham Harkness in the Victoria Foundry. Messrs. Harkness and Co.'s Victoria Foundry, Golden Square, was commenced in a small way in 1858 by four practical workmen, Messrs. Irving, Espie, Braddish and Arundel. The firm prospered, but several changes occurred in the management, until in 1870 it consisted of Messrs. Ruddock and Harkness. Subsequently Messrs. R. Allingham and R. Lisle succeeded Mr. Ruddock in the firm, but they retired in 1881 and 1886, leaving Mr. Harkness sole proprietor. Lisle was one of the instigators of Methodism at Golden Square in the 1850s. He helped purchase a site for the new stone church (open December, 1859), which followed the fust 1852 strycture. The new 1870 church benefactors included Richard Allingham and Union claim holders (Lisle?). Robert’s sistor lived in Panton St, Golden Square, her obituary from the Bendigo Advertiser states: Mrs. Susannah Cockburn, wife of Mr. John Cockburn, died on Thursday night at her residence, No. 45 Panton-street, Golden-Fix this text square, at the advanced age of 84 years. The deceased was an estimable lady, of a kind and unassuming nature. She was a sister of the late Mr. Robert Lisle, an old Bendigo pioneer, of Bell Vue-road. She was born at Northumberland, and had lived at Golden-square for 25 years. She made many friends, and was a loyal adherent and supporter of the Golden-square Metho- dist Church. Besides her husband, two sons and one daughter are left to mourn their sad loss. Robert’s brother obituary was printed in the Bendigo Advertiser 29 October 1907: Roger Lisle, aged 79, late of Kangaroo Flat and Golden-square, brother of Robt Lisle, Belle Vue road, Golden-square. Mr. Roger Lisle, who, alter managing several claims, on the Bird’s Reef, immediately South of the railway line at Kangaroo Flat in the 1860s, went to Queensland, where he assumed the management of the famous Mount Morgan mine. Mrs Ann Gill, the widow of Thomas Gill, who dies in 1912, a retired farmer from Myers Creek; continued the ownership through the First War into the 1930s, when the Star Building Society was listed as 'owner' and the occupier (and mortgagee? ), first James Loy, then John Oualtrough. Oualtrough, a forester lived there, with Elsie Oualtrough, until the 1970s, with Allan Oualtrough owning land beside them in the 1950s. A double-fronted red brick (painted over) villa, with a hipped- form slate roof and concave-profile verandah. Set side-on to the street and the nearby Poverty Gully, it faces across Lisle's other block, back towards Bendigo town. It also faces the United Belle Vue Company gold mine site. The house's most unusual attribute is the verandah detailing. Paired posts (Ionic) support miniature entablatures, capitals and intricate fret-sawn arch spandrels which recall other notable buildings such as 50 Church Street, Eaglehawk, Falkland House, Long Gully (Vahland & Getzschmann, 1870) and 12 Bannerman Street, Bendigo, (R A Love, 1871). Openings have segment-arch heads, with indications of contrasting colours in the voussoirs, and the stuccoed chimneys have relatively slim cornice mouldings, typical of mid, rather than late, Victorian-era details. Immediate mature landscape includes the Roman Cypress specimens. 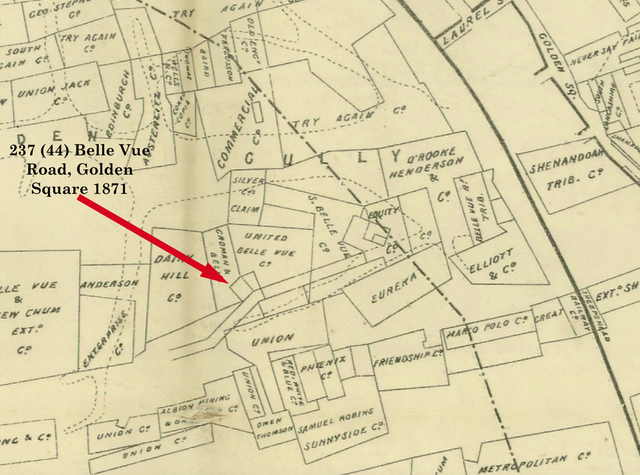 Beyond are the gold fields (United Belle Vue, Eureka, Napoleon United, Golden and Poverty Gullies). Other early buildings include 58, 60 and 51 Belle Vue Road. Mature landscape includes' Cupressus torulosa' along the fence line and a large evergreen tree (possibly an’ Arbutus unedo') which is contributory. Architecturally, the house is distinguished by its ornate early verandah, potentially its brickwork and its adverse siting, which points to its historical associations and lends it prominence, sited on a minor hill. Historically, it is also contemporary with the surrounding major gold mining field and provides valuable built components to the historical importance of this part of the Bendigo field. Its creator and long-term occupier, Robert Lisle, was part of the Golden Square mining fraternity and co-fmancier of the Methodist Church in the locality. The house is basically of five rooms. Note the positions of the chimneys and the curved wall in the corridor. The shared fire-place cavities were in the form where the wrought iron covers and fire grills on each side of the wall shared the chimney. The fireplace was very effective at heating the room. The author can remember staying occasionally in the front room snug and secure in Winter time. The early date of this cavitv wall construction house is enough to make it a house of considerable significance but Love's choice of a novel means of bonding the inner to the outer walls makes it of international significance in the history of building technology. Cavity wall construction had been used since at least the early part of the nineteenth century in Britain. but it was not generally accepted by builders and architects until the 1920s. Restoration writer Ian Fvans. stated that Australia’s first cavity brick walls are in buildings in the Victorian towns of Stawell and Bendigo. constructed by American architect R.A. Love during the late 1860s and early 1870s. Lewis has claimed for Love the distinction of being the architect of the first true cavity wall buildings in Victoria based on his work in Stawell. This Bendigo example is five years earlier, but it is not however. the first known example in Bendigo. Earlier in 1864. Vahland and Getzschmann had built St Monica's Church in Kangaroo Flat with 100 mm cavities in the walls. They had bonded the walls at metre intervals by overlapping alternating header bricks from the inner and outer waIls. The construction was revealed when the church was demolished without a permit. The presence of the header bricks mitigated the effectiveness of the cavities to exclude moisture. In the Lisle house. the front and side walls are about 275 mm thick with a 70 mm cavity. The inner and outer walls are tied using header bricks every second brick in every second course, providing a very secure bond. It also allows air to circulate freely around each header brick. reducing the tendency for moisture to penetrate to the inside surface of the wall. It is possible that specially made header bricks were used to span the walls as one such brick was found in the garden, but this has not been confirmed by inspection. The closest known published bond is that of Loudon’s hollow wall which uses a cavity with Flemish bond. 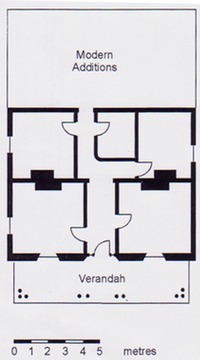 The plan of the house is also a departure from the more common double front with central passage. Unusually the sharp corner in the passage has been rounded in recognition that it would be likely to be knocked. Love has given the doorways in the front rooms a classical treatment. 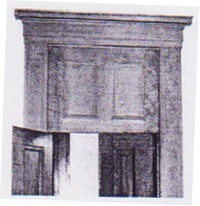 He inserted non-opening timber panels which extended the architraves to almost 2.7 metres. which gave the door, when closed, the appearance of being very tall. The front wall is of triple brick with cavity to give added depth to the entrance door and windows in a wav that characterizes several of Love's later residential buildings. His use of lonic capitals on the verandah posts is also characteristic of some of his later work. Some of the capitals have rotted and been replaced with replicas. 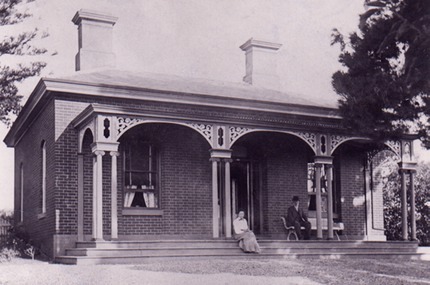 A photograph of the house with Mr and Mrs Lisle on the verandah shows three steps extending the full width of the verandah, in the manner Love later used at Colbinabbin and Stanhope homesteads. The steps no longer exist, so they were probably made from timber. Love designed this house for Robert Lisle a successful mining manager and investor and a staunch member of the Golden Square Methodist Church. Lisle was honorary clerk of works for the construction of the present church in 1872, so is likely that he took an active interest in the mode of construction of his own home. He died there in 1911. A recent owner in the 1990s has inserted a stainless steel damp course into the walls and made additions to the rear. but the original building remains essentially intact. Reference: Bendigo and Eaglehawk Heritage Study-Significant site by Graeme Butler and Associates.